There is a wall dividing our country. The argument over this wall brought about a 35-day government shut down, and the agreement to end the shutdown is for only three weeks, then what? When it comes to the issue of the wall and the shutdown, some people are angry, others are scared, some frustrated and others apathetic. This issue is dividing our country, but whether the wall is built, half built or torn down there will still be divisions. Many walls have been built and torn down throughout history, and we are able to keep fighting against one another either way. The real protection we need is not from what is outside of us, but within us. Inside all of us lives something that is truly terrifying and we are powerless to stop it. In this world of walls, we face troubles no matter what side we are on, and when you worry that nothing can protect you from what is outside or inside, our Old Testament reading from Nehemiah 8 is an encouragement to Rejoice, God Protects You! Though God’s people abandoned him and he gave them over to Babylon to be punished, he would not let them be lost forever. He punished Babylon for destroying his people and allowed a remnant to return to Jerusalem. 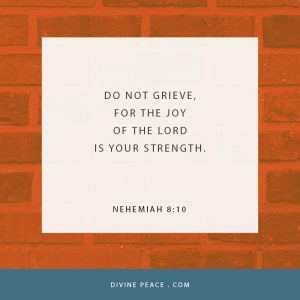 Nehemiah mourned, fasted and prayed. Then, while bringing the king some wine, he asked to leave, to return and rebuild Jerusalem. When his request was granted, Nehemiah returned and helped rebuild the wall to protect Israel. As the people stood beside the wall that had been rebuild, their sins and the sins of their people were so obvious. Israel had learned a hard lesson from God, that turning away from him, meant turning away from his protection. How foolish it would be for a body to turn on itself. And the same is true among the body of believers. We face so many things that threaten to turn us against one another breaking apart the body of believers. We may be for the wall or against it, we may be blue collar or white collar, we may believe in spanking our kids or not spanking them, we may be vegetarians or meat eaters and don’t even get me started on all the rivalries between colleges in Texas or Texas and Oklahoma. All of these differing opinions threaten to divide us as believers and can then threaten our relationship with Christ. Our passion to hold on to something more than our shared faith in Christ or hold on to something more than Christ threatens to completely divide us from God forever. God gives us the same joy as he did to the Israelites. God’s people will always share the same joy because they share the same protection from God. Our joy is not a joy like the world knows. We can experience the joy of choice foods at a birthday party or sweet drinks at a wedding reception, but those events are always short lived and fade away. The kind of joy we have as God’s people lasts. In our gospel reading from Luke 4, Jesus gives us the promise that we can have joy despite long hardships. When Jesus returned to Nazareth, the place where he grew up, he was given the scroll of Isaiah the prophet to preach from. This was life changing for the people. It was better news than any wall being built, whether in Jerusalem or the United States. Jesus told them that whether they were poor, prisoners, blind or oppressed, now was the time of protection and joy through him. our struggle is not against flesh and blood, but against the rulers, against the authorities, against the powers of this dark world and against the spiritual forces of evil in the heavenly realms. Our true struggle in this world is against what can separate us from God. The wall we need broken down is the wall of sin and death that divides us from God. It is a wall the devil continually works to build, but Jesus smashed that wall down on the cross. He paid for our sins, he made peace between us and God, and he gave us the hope of eternal life through his resurrection. We trust in him as our Savior because he revealed his power to do all of this throughout his time in this world. During this Epiphany season, the season of revealing, Jesus reveals his power. We saw it in the Magi who traveled from the east to praise a toddler with gold, frankincense and myrrh because they recognized him as the Savior King. We saw it in the Father calling from heaven and the Holy Spirit coming like a dove on Jesus when he was baptized. We saw it in Jesus’ power to turn water into wine. And, at the end of this Epiphany season, we will see it as Jesus shines with all his glory like the sun on the mount of transfiguration. There is a wall dividing our country, but many walls have been built and torn down throughout history, and we keep fighting against one another either way. We remain divided because the real protection we need is not from what is outside of us, but within. Inside all of us sin lives working to divide us from one another and from God. It is terrifying because we cannot stop it or its consequences. We need protection from it beyond anything this physical world can give us. We need God’s protection. Thank God he has revealed his true protection for us in his powerful Son. Jesus came to save us and give us life. When we die, we will be eternally separated from all that threatens us. We will be gathered together in the walls of the new Jerusalem in heaven that stands as God’s kingdom forever. In this world of walls and divisions, do not be afraid, but Rejoice, God Protects You! Amen.